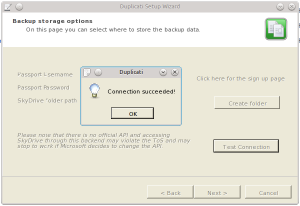 This solved the “connection failure: Error getting response stream” error in duplicati for me on Kubuntu 12. Takes 15 minutes at most. As in this Google Groups thread. Solution, no the other solution! 0 upgraded, 119 newly installed, 0 to remove and 304 not upgraded. Need to get 15.8 MB of archives. After this operation, 53.7 MB of additional disk space will be used. So as as space is tight on my system and as mozroots is only 19kB I decided that perhaps installing all of 50+MB wasn’t really worth it. Instead of that here’s what to do. Download the mono-devel package that apt-get suggests. sudo apt-get install mono-devel -s will simulate the install, note the name of the package. go to Ubuntu packages domain and get the file, for me this was http://packages.ubuntu.com/precise/all/mono-devel/download. Extract the deb file to a local directory, then find the mozroots and mozroots.exe files, note where they are in the file structure. Download and import trusted root certificates from Mozilla’s MXR. 140 new root certificates were added to your trust store. 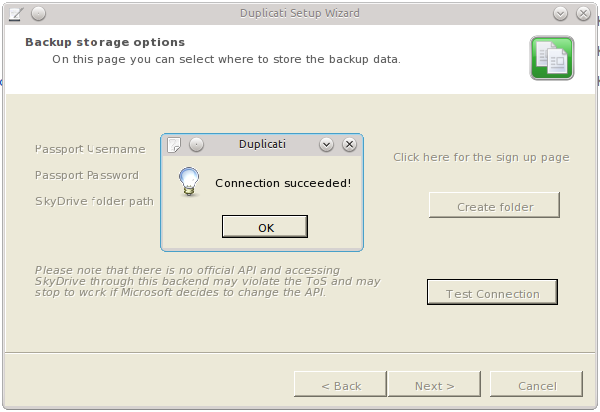 And now duplicati works with Skydrive, or at least it connects and creates a folder in setup. More testing to do to check that everything else is running. Enough to say that this has solved the authentication error. And here’s the .exe that goes in your mono libraries: mozroots.exe. You’ll of course want to run a virus check on that one! 1 Response to "Solved: Duplicati Skydrive “response stream” error"